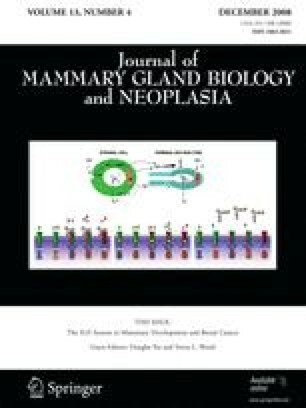 Although the pubertal surge of estrogen is the immediate stimulus to mammary development, the action of estrogen depends upon the presence of pituitary growth hormone and the ability of GH to stimulate production of IGF-I in the mammary gland. Growth hormone binds to its receptor in the mammary fat pad, after which production of IGF-I mRNA and IGF-I protein occurs. It is likely that IGF-I then works through paracrine means to stimulate formation of TEBs, which then form ducts by bifurcating or trifurcating and extending through the mammary fat pad. By the time pubertal development is complete a tree-like structure of branching ducts fills the rodent mammary fat pad. In addition to requiring IGF-I in order to act, estradiol also directly synergizes with IGF-I to enhance formation of TEBs and ductal morphogenesis. Together they increase IRS-1 phosphorylation and cell proliferation, and inhibit apoptosis. In fact, the entire process of ductal morphogenesis, in oophorectomized IGF-I(−/−) knockout female mice, can occur as a result of the combined actions of estradiol and IGF-I. IGF-I also permits progesterone action in the mammary gland. Together they have been shown to stimulate a form of ductal morphogenesis, which is anatomically different from the kind induced by IGF-I and estradiol. Although both progesterone and estradiol synergize with IGF-I by increasing IGF-I action parameters, there must be other, as yet unknown mechanisms that account for the anatomical differences in the different forms of ductal morphogenesis observed (hyperplasia in response to IGF-I plus estradiol and single layered ducts in response to IGF-I plus progesterone).